Michael, My Friend, I’m so glad I got a hold of you three days ago! I called Richard but he hadn’t set up his voice mail. THEN I called Beth as you suggested and there was no answer, but I thought maybe she couldn’t get her phone in time. I thought what a bummer it would be to just tell you lamely “Well,we just couldn’t get in touch.” and I called her back, and she picked up! Richard suggested we meet them in front of the “Parroquia” there in San Miguel, because they would be there in three minutes or so…We had to drive down from an overlook where we were, looking down on the city. We parked where we thought we were within walking distance, and asked directions from two women, obviously from the States. One told us we had about a fifteen-minute walk, but, well, you know us – we were there in about 5 minutes, I think. 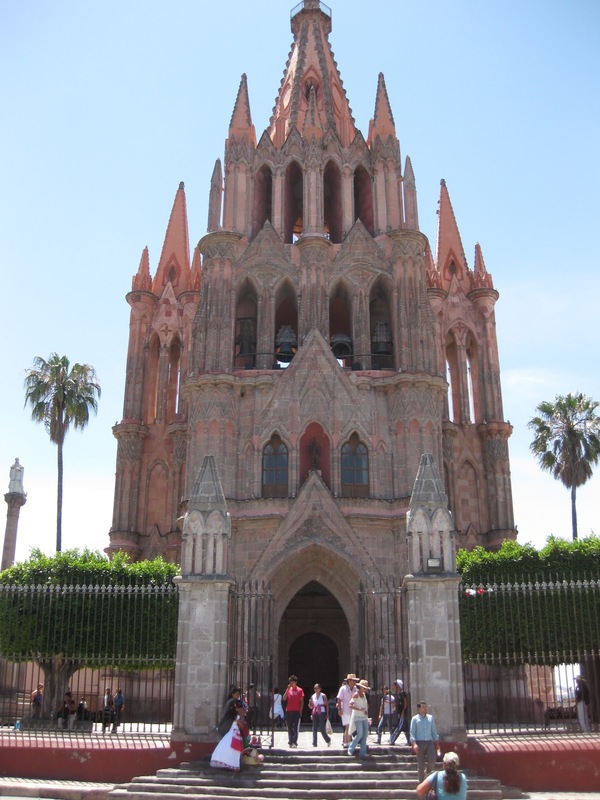 Every town and city here has a “parroquia” or two and you must ask the name. 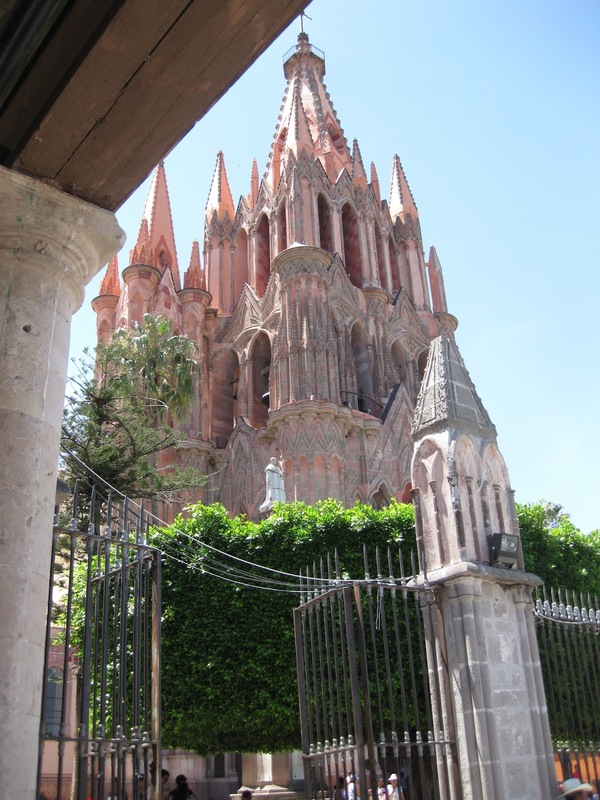 But in San Miguel there is only one Parroquia. It is not a modest building. It is directly across from the Jardin, and things were a-hopping when we arrived. There were many, many tourists, and small Indian women selling colorful toys and bracelets and other things from trays they carried. And we found Richard right away. When we had passed a park earlier on our hike from where we had parked, we saw a tall man with a T-shirt and shorts, and Chon asked “Could that be Richard?” No, that was not Richard. THIS is Richard! T-shirt and shorts, indeed! And David and Beth were there, too, very friendly and companionable right away. I felt comfortable after feeling just a little anxious about finding them. Richard had Plans. He suggested an exploring sort of walk around a few blocks, and it was quite enjoyable, including an art gallery with a friendly artist – “No photos, please! I’ll have to charge you $500!” Richard obediently deleted the pictures from his camera. Chon was looking for information about legal matters, and went into an office and Richard accomodatingly said not to worry, that they would wait in a local restaurant/bar. We took only a couple of minutes, though – most things were closed because of Holy Week – ane we met up with them right away, and had a margarita (two for the price of one – 80 pesos, less than 7 dollars!) And they were delicious, and seemed pretty strong on empty stomachs, so we had some laughs and got to know each other a little bit. I was comfortable with Beth right away – a different kind of artist, a classical ballerina, and teacher. 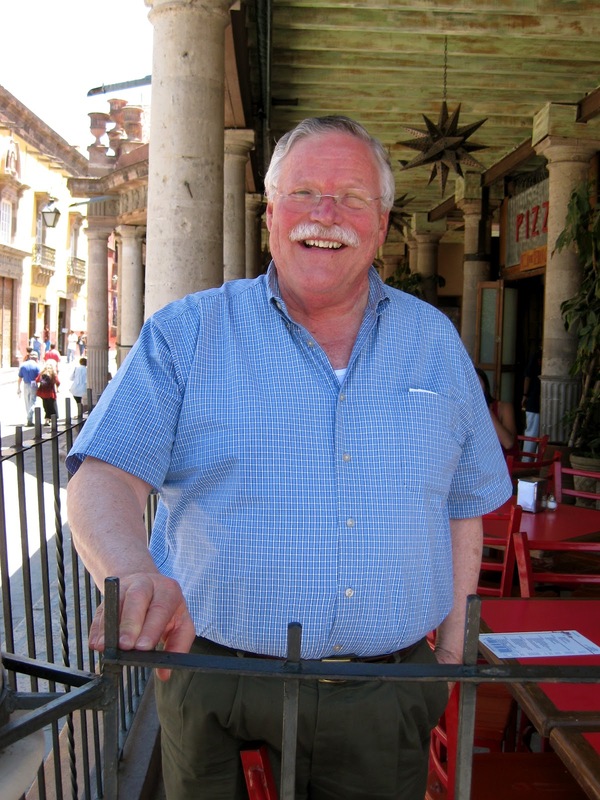 Soon we pushed on, and visited the local library, well-supported, Richard informed us, by the local gringo population. It was quite attractive, and busy for its small size. There were English lessons happening, and lots of posters announcing upcoming events of music, reading, and book sales. The streets were old, of stone, and it seemed like everywhere you looked there were beautiful colors and images. Old doors, colorful houses and shops, stones, brick, and lots and lots of people in vacation mode for Holy Week. We needed to head home by that time, a pleasant two-hour drive, having said we would return the next day. The business we needed to see to was not completed, the American consulate having closed only a few minutes before we arrived. The next day we left a little earlier, and arrived at the consulate around 10:30 in the morning. The consul assistant spoke with us only very briefly, saying “No, you do not need ANYTHING from the consul. Stop by the ministerio publico who will give you a list, and then go to the Officina de Migracion, which will give you a different list of requirements. Since it was Holy Week, the ministerio publico was closed. The immigration office was open, but the line was too long for me to wait for the list after I took a number and analyzed the number of people before me, each with a thick sheaf of papers. We went instead to meet Richard, Beth and David at La Terraza, right next to La Parroquia. They had margaritas in front of them, and Chon ordered a coffee, heavily spiked with rum, with a name, nearly forgotten, “Tarugillo”, like “For Dummies” in Spanish. We heard about the trio’s morning walking tour, given by a woman who had written a lovely book about San Miguel with wonderful photos. And for lunch? Richard knew of a very pleasant restaurant right around the corner, owned by a Frenchman. Everything was beautifully served, and delicious: Milanesa steak, salad, with a beet salad as well, chicken in almond sauce, tacos. The young waitresses were pleasant and attentive. And Richard introduced us (well, me, anyway) to a lovely drink, kir, that I had heard about before, but never had the opportunity to sample. We continued our visit in the lovely and comfortable jewel of a house where our trio of friends were staying – the home of a designer who rents it by the week to lucky travelers. Each space had natural light from above, from skylights (tragaluzes). The furniture and color and art was very beautiful and comfortable. We needed to leave at 3, but we stayed until nearly 5:30, relaxed and happy from the wine and conversation. 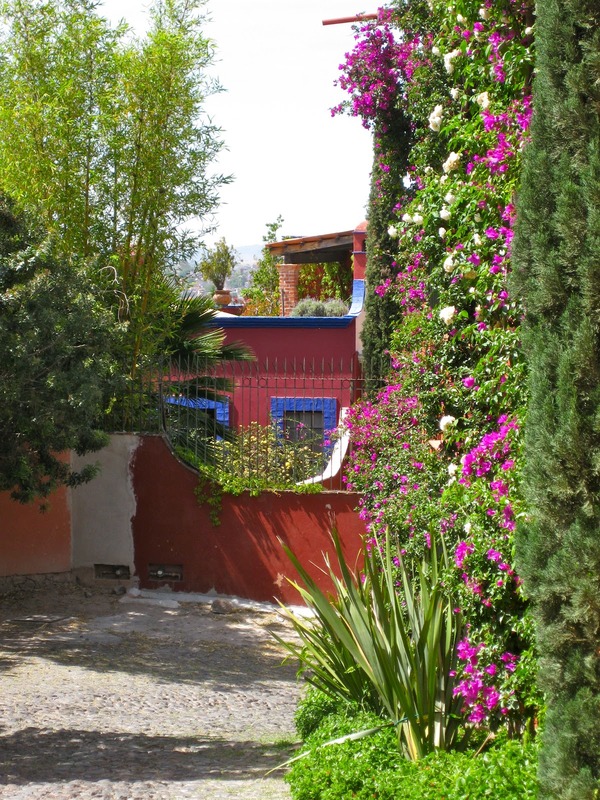 About San Miguel de Allende: it is every bit as lovely as I had heard – flowers, stone streets and sidewalks, gorgeous colors and friendly faces. Everywhere you look there are beautiful vistas. 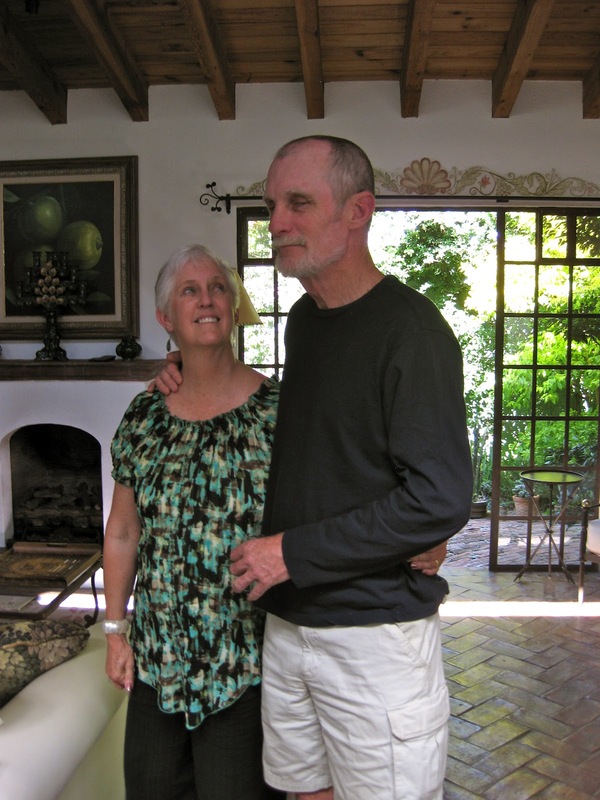 Because of the large gringo population there are shops with different types of clothing and fabrics than can normally be found in Mexico, wonderful food, and thanks to Richard and our new friends David and Beth, comfort and relaxed enjoyment. When we travel to places it is nearly always because of some kind of business, and we don’t take the time to explore. Our two afternoons were like a vacation for us. Thank you, Friend Connection!! This entry was posted in gringos in Mexico, Holy Week in Mexico, retirement in Mexico, San Miguel de Allende, travel in Mexico on April 16, 2012 by gubabbaboy.